Christmas is in less than 10 days, and I am completely unprepared. Last year, I had it all planned out. I made our own Christmas cards, had them stamped and mailed in plenty of time. I decorated the house, even bought a cute rosemary tree and filled it with small ornaments, to comply with our loft's spacial challenges. I had my knitted gifts done and sent with some time to spare. A true Christmas miracle. This year, not so much. Maybe it's our recent trip to this great place - more on that later - or the fact that we are going to Quebec city to celebrate the Holidays with my family this year, making it seem like it's not really Christmas until we see snow. Maybe it's that the weather here has been quite warm and sunny, or maybe, just maybe, it's that I've been drinking bubbly and procrastinating. Either way, the last minute scramble is here, and I'm maintaining a decent amount of constant panic, balanced out by some serious excitement to be home for Christmas. Since graduating, work has rarely allowed me to travel during this time of year, and I'm feeling very lucky, thrilled to be in my favourite winter wonderland for the Holidays. So today, I'm putting Love Actually in the background, displaying my adorable snow globe on my desk, and while Graham is browsing the internet to complete his Christmas shopping, I'm getting ready for a creative marathon. Wish me luck. Last week, I finally made it back to my knitting group, showing off my finished Paloma cardigan, which I'll share soon. 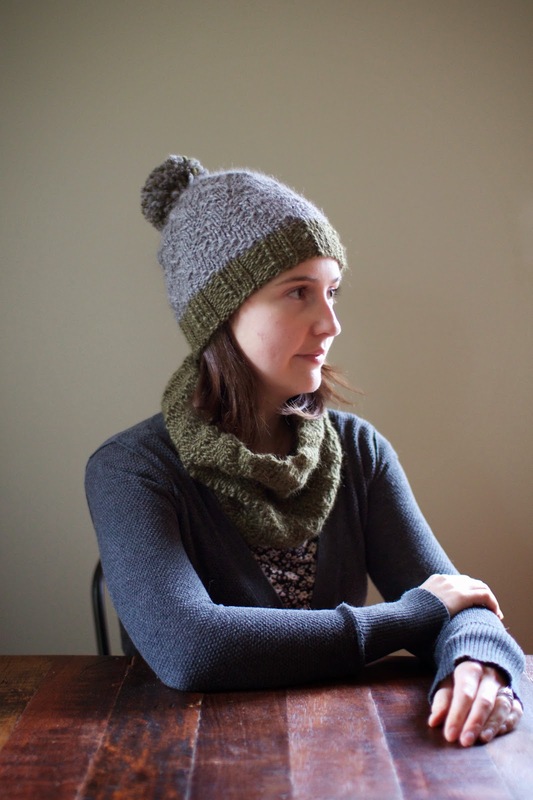 My friend Kate, who had first sent me the Zig cowl, asked me to share how I made a matching hat, and I'm happy to oblige. After making this first cowl and this second one, I had left over yarn in both colours, so I decided to make a hat to go with. I used the cowl's pattern to inspire my design, and I'm quite pleased with the way it turned out. Graham tried it on for fun and suddenly I was fighting him for it. He kept repeating "this is so soft" so I hurried up and made a huge pompom for it, figuring it would keep him away. It has so far, but I'm keeping a close eye on it. I'm so happy with this hat. 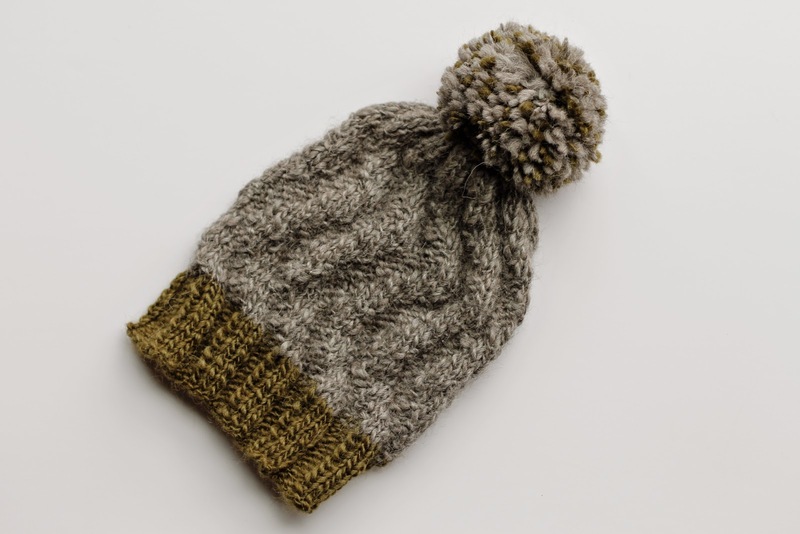 It is soft, slightly slouchy, and I love the bicolored, thick and thin pompom. It's been pretty much glued onto my head since I finished it, and the fact that I'm worried that Graham might steal it or that I was too lazy to wash my hair a few too many mornings has just a little to do with it. It was perfect for our cold weekend to this amazing place, perfect for long walks, and so soft I'll happily wear it inside. It's this year's favourite hat so far, and I'm planning on making great use out of it. Plus, it's a quick knit, so you still have plenty of time to make one for Christmas, if you're anything like me and you've been procrastinating these past few weeks/months. 1 skein of Rio by Tahki Yarns or similar thick and thin yarn, plus small amount of contrasting colour if desired. 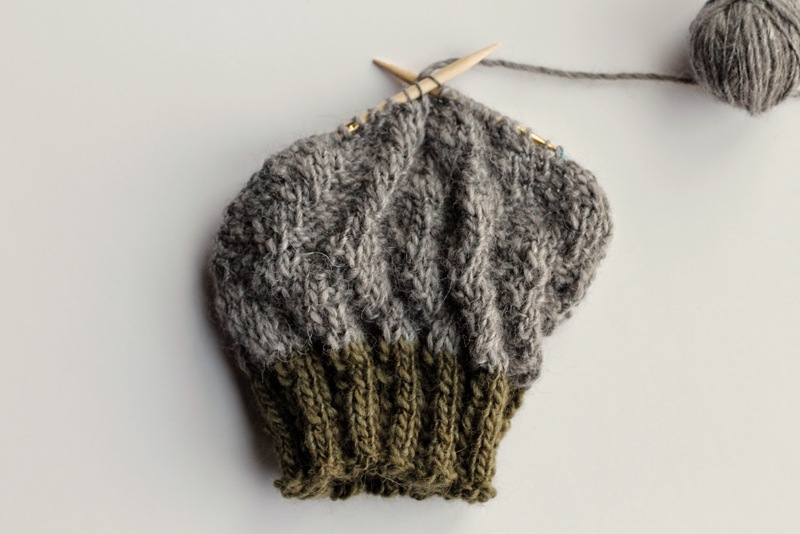 If using only one colour and planning on making a big pompom, you will probably use closer to 1.5 skein. With your contrasting colour (if using), the size 8 circular needles and the long-tail method, CO 66 stitches. Place a stitch marker to identify the beginning and join in the round, being careful not to twist. *K3, P3*, repeat until your work measures 2". Change to main colour and size 9 16" needles. Rnd 1-2: *K3, P3* repeat until the end of the rnd. Rnd 3-4: P1, *K3, P3* repeat until the last 2 sts, P2. Rnd 5-6: P2, *K3, P3* repeat until the last st, P1. Rnd 7-8: *P3, K3* repeat until the end of the rnd. Rnd 9-10: K1, *P3, K3* repeat until the last 2 sts, K2. Rnd 11-12: K2, *P3, K3* repeat until the last st, K1. Rnd 13-14: *K3, P3* repeat until the end of the rnd. Rnd 15-16: K2, *P3, K3* repeat until the last st, K1. Rnd 17-18: K1, *P3, K3* repeat until the last 2 sts, K2. Rnd 19-20: *P3, K3* repeat until the end of the rnd. Rnd 21-22: P2, *K3, P3* repeat until the last st, P1. Rnd 23-24: P1, *K3, P3* repeat until the last 2 sts, P2. Repeat rnds 1-12. Total of 36 rnds before decreasing. Rnd 1: *K1, K2tog, P3* repeat until the end of the rnd. Rnd 2: *K2, P3* repeat until the end of the rnd. Rnd 3: *K2, P1, P2tog* repeat until the end of the rnd. Change to DPNs. Rnd 4: *K2, P2* repeat until the end of the rnd. Rnd 5: *K2tog, P2* repeat until the end of the rnd. Rnd 6: *K1, P2tog* repeat until the end of the rnd. Rnd 7: *K2 tog* repeat until the end of the rnd. Pull tightly, break yarn. Using the darning needle, weave in the ends. 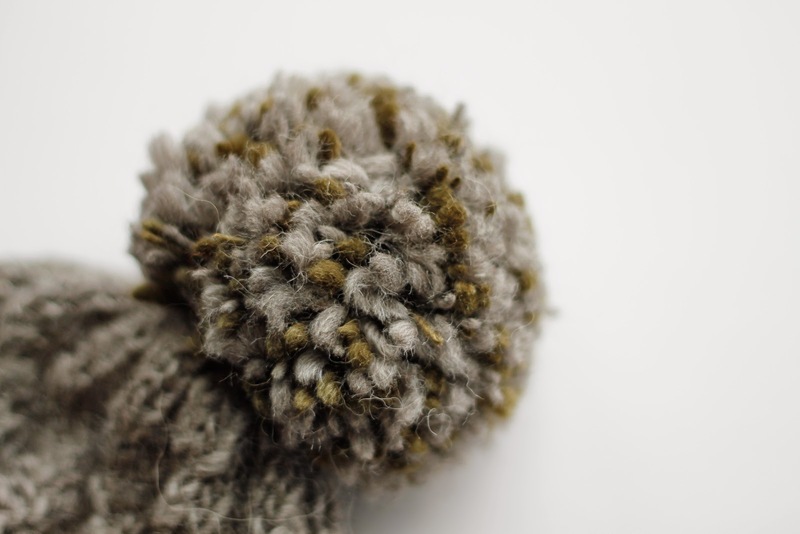 If desired, using both your main and contrasting colour, make a large pompom with your favourite method. I followed this tutorial. 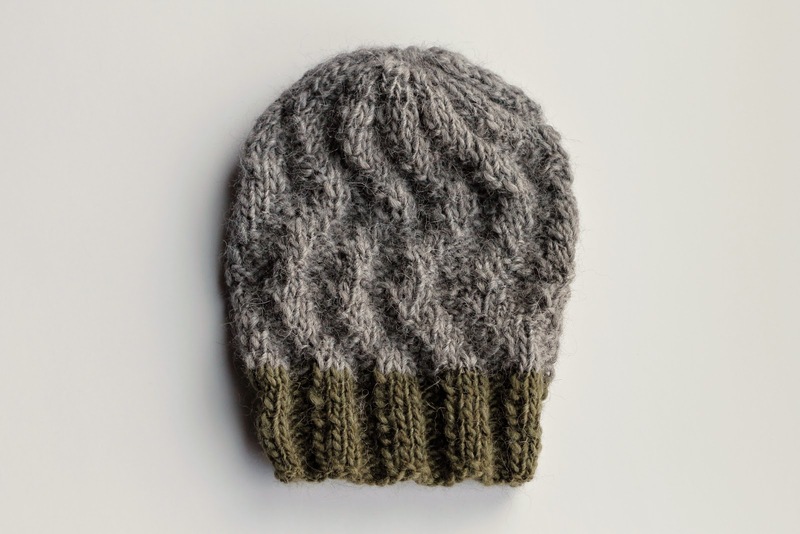 Attach to the top of the hat, weave in ends. Voilà. Finished length from cast on edge to top is 9 1/2". 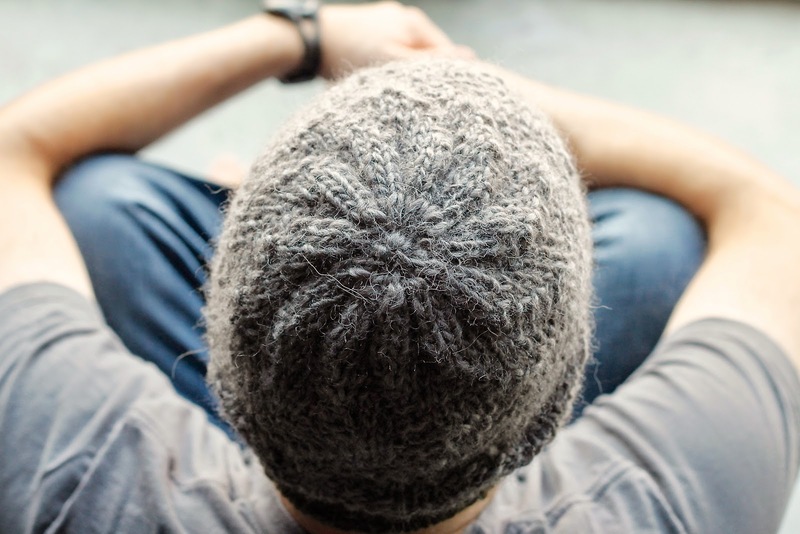 If you wanted a more slouchy hat, you could knit rnds 1-24 twice, for a total of 48 rnds. You would need to change to decreasing stitches to SSK to lean to the left, in keeping with the zig zag pattern.